New term, new classes, new teachers! We are so excited to introduce a new yoga class at our dance school in Marbella. Yoga is a mix of physical, mental and spiritual practices and disciplines. Through strength, stretch and meditation, it improves health, flexibility and mind. Increases muscle tone, improves respiration, energy and vitality, protecting your body from injury. Not to mention the improvement of cardio and circulatory health. 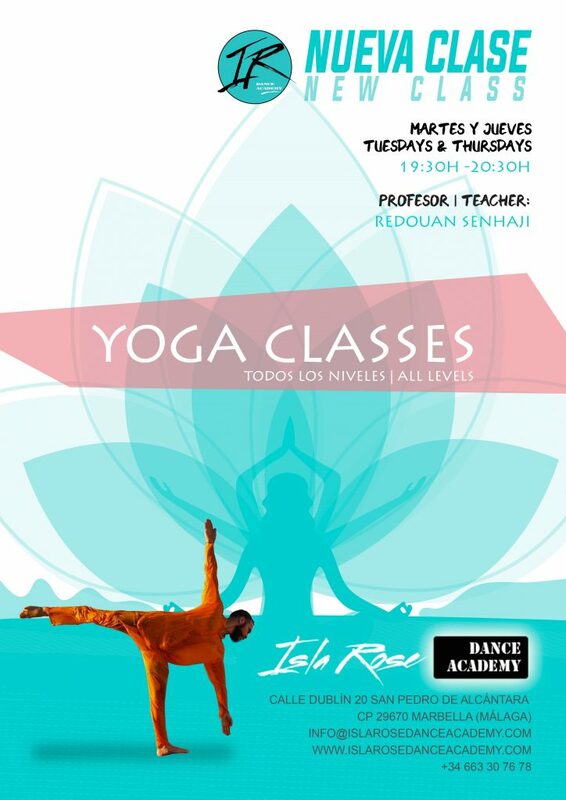 The yoga class will be taught by teacher Redouan on Tuedays and Thursdays, from 19h30 to 20h30. Redouan is a well rounded performer. Having trained in Yoga, Breakdance, Contemporary, House, Zumba, Afro and many other styles, he has traveled the world with his knowledge and showmanship. Redouan danced for “RUMBA” Mayumana, “Sama Sama” Circus of the Sun 2015-2016 & Mayumana, the ballet of Europe in France. In 2010 he began training as a contemporary dancer with the ballet d’europe “Jean Charles Gil”, in France, for 4 years. Redouan has taught dance in Morocco France and Spain and has his Yoga teaching license. Redouan has also competed, won and judged many dance competitions at a national and international level in places like France, Senegal, Morocco, Spain, Italy, Lebanon and Dubai. With his crew “Break or Die Crew,” Redouan participated in festivals and TV programs such as International Festival of Art “Nights of the Mediterranean” (Tangier) Finalists in Arabs Got Talent 2013, in Lebanon and International Black Arts Festival in Senegal. Give yourself the chance to improve your body and mind health. Sign up for your yoga class by selecting the class in our schedule clicking here.